Recently I’ve begun to ponder the meaning of art, and whether or not it is necessary or simply a luxury for me. For someone who claims to be an artist, I do surprisingly little art, and do not consider it a viable source of income. Michal sees art as a necessity, and as such, we argued over the true meaning of art one night. Seeing as I had so little backup for my argument, and never finished my reasoning for this belief, I'd like to take the time to write a little bit of my history with art and why I would say something like this. Art has been a journey in my lifetime. I explore what it means to be a human, and to be a woman in this modern world. However, it is purely for my own pleasure as I do this. I've even said that I express myself better in my art than I do in any other means. 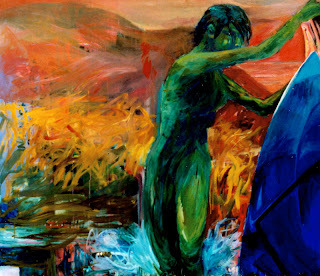 Emotion plays a strong role, and therefore, several of my paintings range between ecstatic to morbid. I rarely show my work to the public. Even now, I have art hanging up unlabeled at a small local coffee shop; unknown and un-priced! Oh, the travesty. I keep telling myself that someday, I'll bring labels to hang up, but I know that I won't. When Michal and I first met, he hung a student show containing nothing but my art. I believe I just turned 18. I was a very quiet person back then, and very content to remain so. During that first year of college, I painted like a madwoman. Some of my best works were made in that time. In fact, the painting which sparked Michal's first interest in me was made in that time. Here she is shown above, very small compared to the original, which is the largest painting I've ever made. (~5'x6') I still have mixed feelings about her, and about all my art. Sometimes I think about giving it up, along with all my pieces, donated to some charity or other. I remember writing for one of my many, many college courses a paper on the philosophy of art. Not to bore you with mundane movements of recent past, art has been a long process over thirty thousand years old. That's how old they say the paintings in the French caves are. Who am I to debate carbon dating? Supposedly, everything in art revolves in a cycle, doomed to revolve around the fads and fashions as each era passes, and each generation of people adopts these elements as their own. To say my art is unique among thousands, where thousands of people have used the same instruments as I, and employ similar techniques seems absurd. In my paper, I attempted to describe what it meant to be an artist and the philosophy of creation. In essence, after many events, I now question if my passion for art is the same as it was five years ago, or ten, or fifteen. Ever since I was a young girl, perhaps as young as seven, I told myself that I would be an artist. Now that I am older, I doubt my reasoning for all my actions thus far in my life. "What the hell am I doing in North Carolina," is a frequent question that I ask myself. "What is next?" While some may debate these vague thoughts of mine, I know that my pursuit of art is a luxury at this time and place. To be a successful artist takes great effort and communication, and these are things that I haven't done. This is not to say that I won't ever make the attempt, but so far, the time is rapidly ticking away, and the artist is lazy.